This post may belong in the Electrical forum, but I thougt this to be more of a general rather than a technical question. We are thinking about adding a TV and antenna to our boat. Other than the typical trucker's various Skyworth TV models does anyone have experience with 12-volt powered units. Some household TV power bricks are designed to convert line voltage to 12-volts and that is a good option as I can bypass the brick and simply connect to a suitable DC circuit. I do not want to power the TV with an inverter because of the additional power drain. Any suggestions? We have a Majestic 12 volt tv/dvd tv it is now over 10 years old and works like a champ. Wired directly into the boat, it operates on 9.5V to 18V DC. We are very happy with it. I have a Skyworth and it's been fine for several years. I think Jensen makes 12 volt models and there are probably others. The problem with buying a 120 volt TV with an external power supply and cutting it off and wiring it directly to the boat's DC is that on a boat "12 volt" is not really 12 volts. As your alternator or battery charger kicks in to charge the batteries, you (and the TV) may see fourteen or even fifteen volts. That's fine for the batteries but if the TV doesn't have an internal voltage regulator, that will probably burn up the TV. I would recommend buying a TV set that is designed to work on a truck or boat's electrical system. No, don't limit your choices like that, most devices that are "nominal 12V" actually tolerate a pretty wide range, say 11-15V. And if you're really concerned, DC-DC converters/regulators/conditioners that ensure steady voltage output aren't too expensive at these low amperages, check out ham radio suppliers. 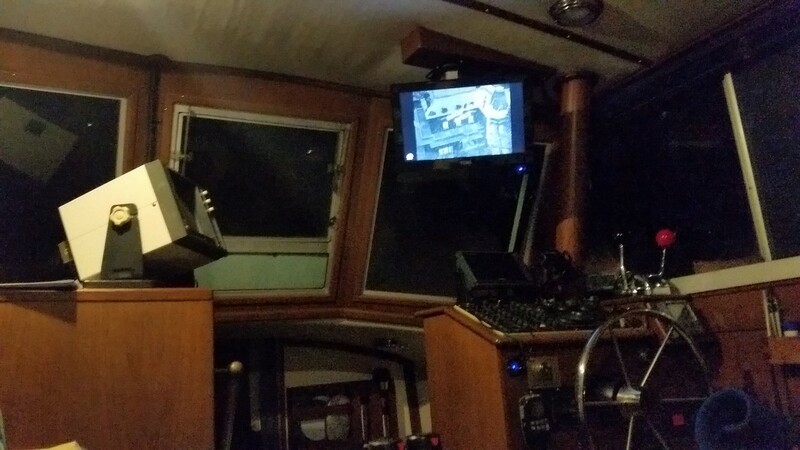 Some years back after the country went to digital tv broadcasts, I had an older analogue tv in my 2006 Mainship. I wanted to replace it with a new and bigger 12V digital model. So, I went to Best Buy and looked at several tvs in the right size range. I followed the power cord down to the brick and then looked on the back of the brick for its output voltage. Only one was 12V, most of the others were 19v like laptops. But it was a nice tv, so I bought it, clipped off the brick and wired it directly to an accessory DC breaker on the boat. Worked fine. As the OP said, most tvs can tolerate a wide variety of input voltages and a nominal 12V powered tv should work fine on a boat. We have a 16" NAXA 12v TV and DVD player on a flip down mount hooked up to a Shakespeare amplified antenna.. Forget where I got it (Amazon Maybe?). Works great and pulls in 25+ stations with no problem..
As a former electronic technician, I would not count on that. It has apparently worked fine for some folks but will it work for you? It depends on where the regulator is located and that's not going to be on the sales literature. Do you have any specific knowledge of a boat's electrical system damaging a nominal 12V television? I replaced the Sole' T.V. on my Mainship with an Insignia brand T.V. It is a TV/DVD combo. All I did was cut the brick off of it and spliced into the exsisting 12 volt circuit. That was 3 or 4 years ago and I have not had an issue. Only one was 12V, most of the others were 19v like laptops. DC-DC conversion is no problem, the point is avoiding double-inefficiency of using an inverter. Lifes short, why limit yourself? Needing an inverter has nothing to do with size. Even a 60" screen is <90W these days. With a native 12 volt TV, you just push the button and enjoy. Using an inverter or converter, you have to turn that on and off in addition to the TV. In over 400 days living aboard I have not turned my inverter off once, the fridge would turn off if I did, the beer would go warm, there would be blood. Not everyone powers their boat with a full time inverter. Many boats have 12 volt or AC/DC refrigerators and don't run an inverter 24/7. An inverter has a "standby" current draw even when it is not powering anything. That's extra power being consumed. Yes, radically different philosophies here. I like being able to go for a week offshore burning dino juice maybe 2-3 hours, rest of the time nice and quiet. If you're running fridges off an inverter (really? why?) then of course, run everything that way, no problem. Because its a lot cheaper than a 12v option. We run a 500 litre Samsung fridge/freezer with chilled water and ice maker and a secondary 100 litre freezer all on 240v. Here, a 12v 60litre Engel camping fridge costs more than that full sized fridge. Solar meets most requirements - genset only runs about 3 hours/week. Here, a 12v Engel camping esky costs as much as that full sized fridge. And you cannot imagine anyone having a different setup, perhaps on a smaller boat? Of course I can, but I was answering Johns question as to why oh why would anyone have anything else but a 12v fridge. Even if I had a small boat, and I have before, I would run an inverter and a small $200 240v bar fridge and be well in front.